Today was interesting. Upon arriving at the show we finally met Rob from Voice of the Collector and talked for a bit about things. 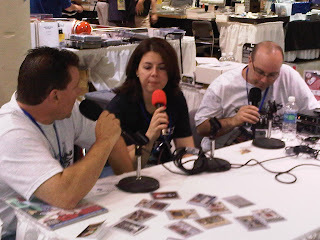 Rob then asked me to go live on Card Corner Club Radio and tell everyone a little about the meeting with the Topps panel from the night before. Many people missed the chance to meet the Topps guys because of the meeting falling on Thursday and not the weekend. If you want to hear some of the show just head over to their website. They will also be streaming live from the National for the rest of the show. I was able to pick up some cool game used cards from a bargain bin and a Pujols "RC". I put that in quotations because I learned a little bit about what defines a "RC" by Beckett's guide. I noticed that some of my RC's did not show up as RC in the my organize and learned why today. If a "RC" is not in a set that has both rookies and veterans, as well as a comprehensive checklist it will not be labeled as a RC in the price guide or in your collection on their site. Interesting stuff. We also helped Freedom Cardboard today with a free signing they sponsored with Junichi Tazawa. The team walked around and gave out 200 tickets for people to get a free item signed sponsored by FCB. I was given one of the cards, which you all know how much I wanted a Sox prospect.... but I may give it away to someone. I am debating opening a junk wax box from 2002 or later. Any suggestions for a box? Help me out. I was looking at 2004 Fleer Platinum rack pack box with 4 autos per box, or something else goofy. I did a break on video of 2004 SP Prospects which Sooz did nothing with so far, ahem. Leave me a comment and let me know what you think would be fun to buy and we will do a live break or tape it. Something with 4 autographs per box does not really match the definition of 'junk wax'. I really liked Platinum with the 1984 ripoff design though, so go for it. 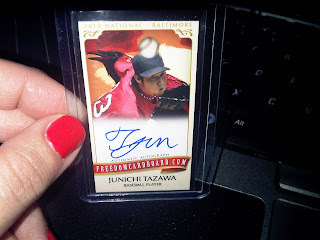 I like the design of that Tazawa card. Who designed it for Freedom? Did you give it away yet?